This series of sapphire lenses is currently in limited production. Please consult the factory for availability. Other diameters and focal lengths may be special ordered. We can also supply parts with anti-reflection and other thin film coatings. Quantity discounts are available. 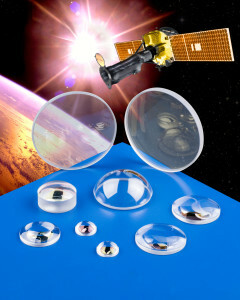 Sapphire Lenses are typically custom fabricated to customer specifications. For more information, or to request a quote please Contact Us.